In the light of this being the Advent Season and in the wake of the ending of ebola in Sierra Leone I was brought to think of this following post on our NHA Blog. The Terrorism, Ebola, Greed and evil rising in the world today all bring to mind the suffering. And as it often does, this young man's plight, pierces my heart. He is only one of many many people suffering today. This morning I woke up thinking about Mohamed. Its been a good while since I last saw him in Freetown. I remember the first time I saw him and others like him. Their wounds fresh. I was stunned by the capability of one human being to inflict such horrific pain on another. I couldn't image how his life would be and how he would survive... but I had no idea the magnitude of suffering he would endure until I was made aware of it through James' eyes and words from the heart. 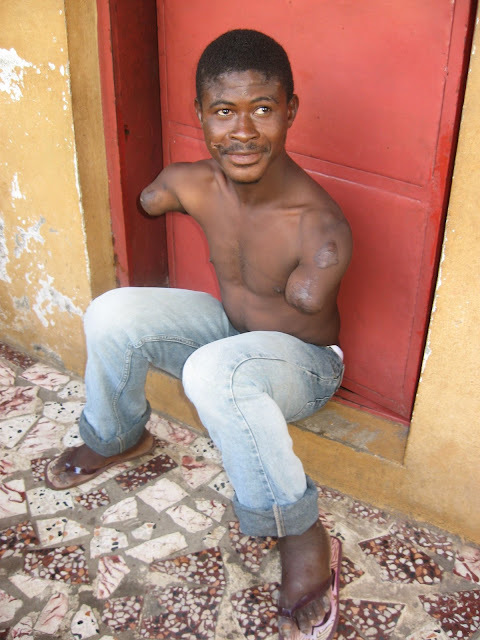 Especially in the early days after the war, we would see people in Sierra Leone with amputated arms and legs everywhere. The streets were bare because so many had fled, the amputees were left behind to suffer their radically altered life in Amputation Camps. They were with others suffering the same situation but yet they were alone. Now days, Freetown streets are packed and busy. The amputation victims are still there but less noticeable in the crowds. 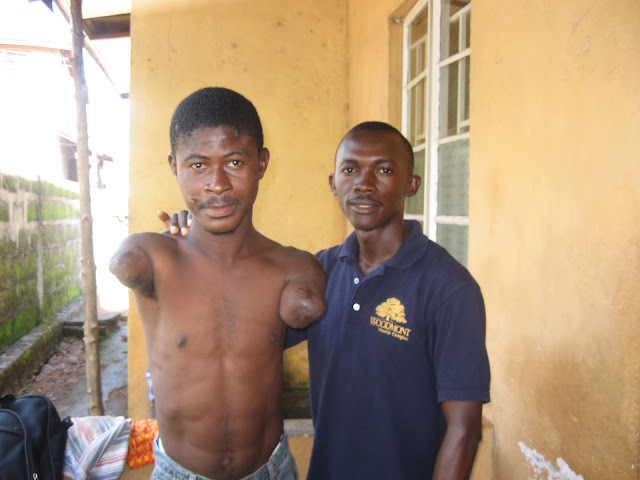 I've been with, attended to and befriended many amputees in Sierra Leone . But until the day I received the following email from James (June 2007) telling me of Mohamed's plight, I hadn't realized the extreme trauma and the continued turmoil they are forced to live. And the reason I hadn't realized the depth of it all was because the people themselves handled their misfortunes with such dignity. No one shared with me the fact that they often soiled their clothes because they didn't have the hands to unsnap/pull down their jeans and relieve themselves. Instead they were busy welcoming me to Sierra Leone and thanking NHA for any assistance we could give them. They were making sure I was comfortable in a foreign country. Their life was now very limited but they were alive and they adapted the best they could to make life happen in the midst of great turmoil. Of course they told me their stories and lamented their inability to live a normal life - but they also told me they could either give up and allow self pity to run their life ....or.... they could carry on with dignity. For the most part, the majority of the amputees set out to overcome their disadvantages and live their life. I think Thomas Merton described the attitude of the Sierra Leone War victims in this quote: "You do not need to know precisely what is happening, or exactly where it is all going. What you need is to recognize the possibilities and challenges offered by the present moment, and to embrace them with courage, faith and hope." It has been said through the media, press, internet, cnn tv, the world as a whole etc. that the ten years brutal rebel war in my beloved Country Sierra Leone waged by the Revolutionary United Front sponsored by the then President Charles Taylor of Liberia was basically aimed at seeking control of diamond mines of this poor nation. Though it is ten years away now, we still feel, see and experience the pain of it. It has been said by many, Churches, the UN, and other religious bodies that we should forgive and forget. Yet, put your self in these poor man's shoes. Yes, as Christians, we should forgive but i see it very difficult to forget this odd past more especially as i see more victims of this said war still suffering. From my own point of view, and as a victim of this fierce ten years of brutal murder, humiliation and carnage, I still see the trouble continue. Reasons for this I will explain below. If you take a walk down the streets of Freetown where I presently resided, you must catch a glimpse of either a one footed man or a young graduate with both hands being chopped off for no just cause. Sometimes it is hard to believe but this is true. A whole lot has been shown by the United Nations Peace keeping force helping us out but I must confess that little has been done for those living in the cracks, by this I mean those poor boys and girls roaming around the city with one eye, one ear, one leg, one limb or both limbs missing. Now take a close look at this young Man called Mohamed Kargbo who is among those still struggling the results of this war and whose physical figures was wickedly transformed by few wicked men out of greed and selfishness. I had seen men in pain and frustration but what I saw in this young man this Thursday morning set me into tears. It happened in front of our little St. Laurence prayer house when my wife Kadijah noticed this young man with no limbs struggling with something. As a Woman she knew it was something that only a man can deal with so she called my attention to help this guy. At first I thought he was in need of food or something but as I get closer to him I realized that he needs something more than food. Poor Mohamed I guess had a bad meal or sick with Diarrhea was in desperate need of using the bath room but was too late or shy to say so, tell me how can you take off your pants off with no hands in the middle of a crowded old City like Freetown when you know the after math of what will follow. Poor mohamed had no option instead he decided to use the nearest gutter to help himself where he got stock and could not move. The gutter was so deep that he alone can't get out. With my help and a good Samaritan who was passing by we both gave him a bath inside this gutter before we later took him to the back tap at St. Laurence house where we bath him proper with soap. I had to get new clothes for him to put on and some Loperamide Anti- Diarrhea pill that we recently received from our sponsors at Grace Church thru Nazareth House Apostolate to help ease his stomach problem. After the odd part of this mornings event, I mean the cleaning up, I saw great need in this man and it was clear to me that I should not let him go empty. In my agenda this morning, I was to take rice for distribution to some of the poor and needy people here in Freetown so I thought it wise to also help Mohamed out but he sadly told me that he has no dwelling place, he sleeps where ever the night finds him. But Mohamed desperately needs help for he is just a human being like us. My wife and I agreed that if he so desired, he could come for food everyday at St. Laurence house to keep himself going. To save his present trouble, we provide him enough for a week and also gave him a handful of medication for his diarrhea. 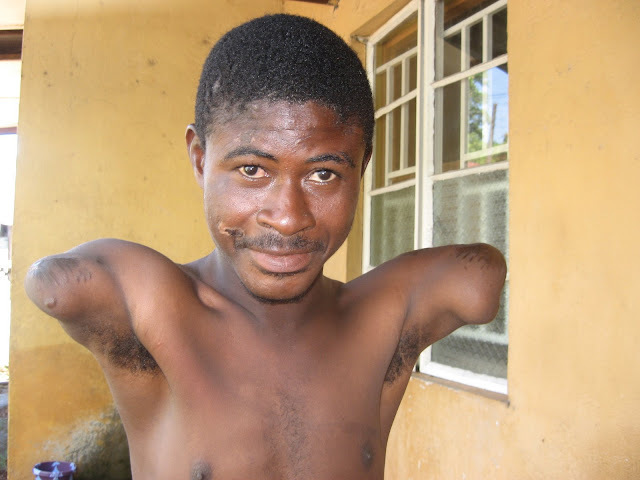 Following the story that lead to the amputation of both of his hands, Mohamed said he was caught by the rebels in Makeni Town. He was in his farm together with his mother, father and four years old sister. The rebels place his whole family in their farm hut and set it on fire and then forced him to join them in the fight. Two days later he tried to escape together with a police officer when they were caught. Both of their hands were chopped before they sent them away to report to the other villages that they are on their way. The poor police officer could not bare the pain and shame and forced the rebels to kill him. Having walked the bushes for a whole week with no food, Mohamed found him self in Lunsar. Mohamed giving us a view of the hands he lost at the hands of the RUF Rebels. Please remember those who silently struggle day to day in abject poverty struggling simply to provide a daily meal for their family, for those handicapped, for those in pain. 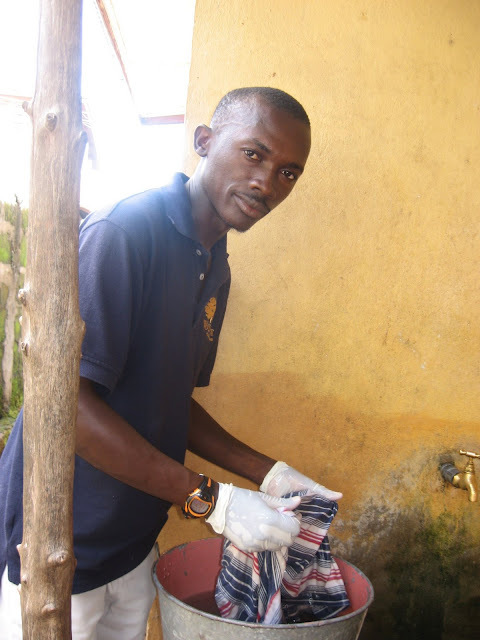 Pray for them and pray for NHA as we strive to serve them in Sierra Leone.